BoldGrid is the best drag-and-drop website builder powered by WordPress. BoldGrid has the ease to attract beginners because it is so much easy to use. Today, I am going to show you how to find, install and customize BoldGrid themes. BoldGrid Themes: What Are They? 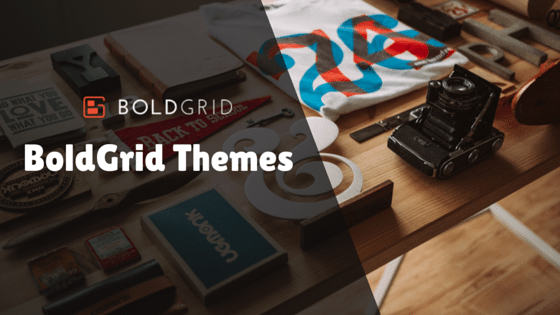 As you know that, in WordPress we use the term “Themes” but BoldGrid has given it a name “Inspirations“. Remember the name Inspirations because this name will be used in this article. BoldGrid has a collection of Inspirations ranging from every type of business. It also has prices, don’t worry free themes are also there. One more thing, each Inspiration or theme has its demo data or pages which you can use to get an idea of your site. This feature is only offered by BoldGrid. BoldGrid Themes: How To Get Them? Now, you’re thinking that “How to get BoldGrid Themes” Well, buddy that’s so much easy. Here are some ways to get BoldGrid themes. This is the most recommended way to get BoldGrid themes. If the themes are created by BoldGrid itself then they are obviously most compatible. Did you remember: Inspirations means themes. Got it? How To Install BoldGrid Inspirations? First of all, Login to your WordPress admin panel. Then, click on “Inspirations” in the left sidebar. Now, if you want to install new site then click on “Install New Site” or click on “Install New Themes” if you just want to install the theme on your staging or active site. At that page, you will see a lot of themes in your industry. When you got a theme then just install it. It will redirect you to a page. After some time, the theme would be installed. Congratulations! You have learned to install boldGrid Themes. In next step, you’re going to learn how to customize your BoldGrid Inspiration. As I have told you, BoldGrid’s own themes are highly customizable. You can customize any theme according to your need. Don’t worry, you don’t need to hire someone for that. First, find a theme which suits on your website. I have explained how to install them, in the previous step. Follow these steps to customize the theme in BoldGrid. After installing your Inspiration, click on “Customize” in left sidebar. I know, it is looking like WordPress’s customizer, in fact, it is same as that. Well, this is a user-friendly editor to customize your theme. First change the colors, then move to the logo and then widgets. There are so many other options and features which you can use. Well, you can customize this as much as you need. Basically, you can even change the whole look of the theme. Well, all WordPress themes works on BoldGrid but you can’t experience the full features of BoldGrid on the themes that are not compatible with WordPress. If you’re using a simple WordPress theme then that would have all functionalities like in WordPress but you can’t experience all features of BoldGrid. That’s why it is not recommended to use any external theme. 2nd option is the better one because you can change the theme according to your needs. So, here the article ends. Now, install your BoldGrid Inspirations. Don’t worry, using BoldGrid is really easy. You may try yourself. Bonus Tip: Go with an official recommend web hosting. InMotion Hosting is officially recommended by BoldGrid. If you would go with InMotion Hosting then you have a chance to get 6 months free.